“According to a piece of Mary's artwork from Grade 3, I am her hero,” boasts Lizzi Bradley, co-founder of Little Minnow Designs. 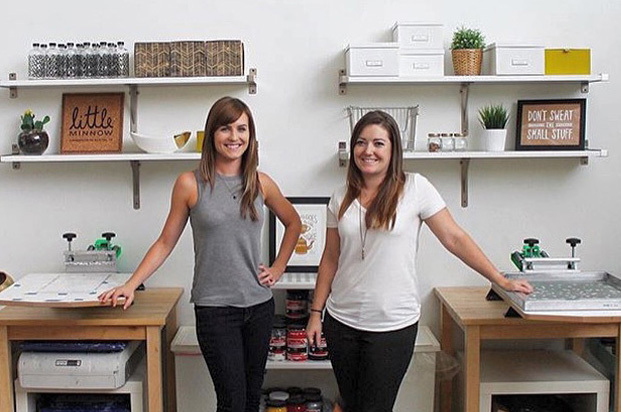 Today, Mary and Lizzi inspire each other regularly—leaving their weekly business meetings energized and ready to tackle new projects. Our ever-popular flower pattern, screen printed in dark and light gray on a teal colored scarf. So soft and stretchy, you’ll want to wear this scarf every day! It’s warm enough for those chilly winter months, yet light enough for the spring and fall. Ready to ship. Scarf comes packaged with a how-to-wear tag–perfect for giving as a gift to your sister, mom, friend, teacher, boss or maybe just yourself? We suggest hand washing and air drying, but we’ll be honest, we throw ours in with the rest of the dirties and in the dryer too. The ink has been heat set, so it’s not going anywhere. Proudly designed, printed and constructed in Austin, Texas.